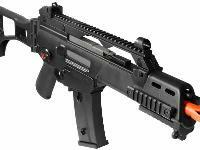 The HK G36C Submachine Gun is an elite airsoft gun made for the serious airsoft enthusiast. 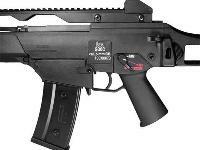 This heavy duty gun is manufactured by Ares who are a company that take pride in creating excellent replicas of military issued firearms with a high standard of quality and performance. 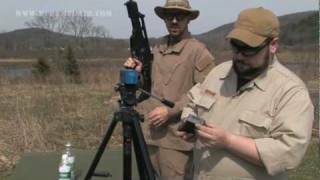 The gun is made with a high torque motor and metal gears with 8 mm bearings to provide maximum quality and effect. The high quality fiber body holds up to rugged conditions, and the high-capacity 470 Rd magazine allows you to shoot for a long time between reloads. 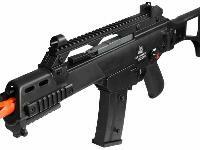 This is an authentic, licensed HK replica of the real G36C rifle. The adjustable rear sight allows for precise aiming, and the adjustable hop-up system lets you fine tune your targeting. 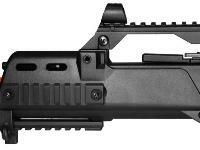 A foldable stock makes transport easy. Fires at an astounding 1000 rpm! Used extensively in milsim and tactical training scenarios where realism is of the utmost importance. 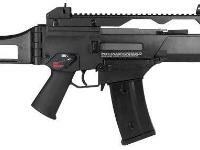 - H&K G36C comes with a 1 YEAR warranty provided by Umarex USA. Things I liked: (Read last Review Piece for needed information) Ok, so I like the good rate of fire and FPS. It is pretty accurate, but I had a slight issue with the iron sights, which I think I resolved. The rails are great and don't shake (most other airsoft guns need to be tightened), and the stock works without fail. 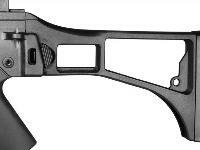 Metal parts, and supposedly synthetic fibers make up the gun. It very well could be hard plastic, as I haven't tested the material and do not have enough experience with "synthetic fiber" to know. (Could very well be called that to make 'Hard Plastic' sound more professional, I do not know) I would also say I like the magazine. BUT, as I said, read the bottom part for more information. Things I would have changed: A lower price, BUT mine was customized, so that is a problem on my side and not with this good gun. Maybe an increase to FPS, but read below. I also found it slightly difficult to put the battery in it, but my battery was a custom 9.-something and it could be the battery, not the gun. Overall, though, all issues seem to be mere user-error (from customization) and not issues with the gun. 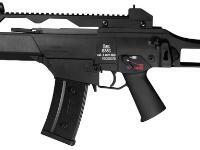 Included: 470 Rounds Hi-Cap magazine, manual.